This year marks 200 years since the birth of Frederick Douglass, the escaped slave who became one of the greatest orators and writers of his generation, a leading abolitionist and political activist of the nineteenth century, and one of the most significant figures in American history. 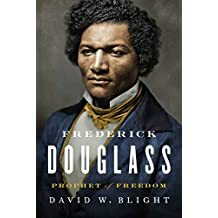 On October 16, Simon & Schuster will publish the first major biography of Douglass in a quarter century: Frederick Douglass: Prophet of Freedom ($37.50) by award-winning historian David Blight. Blight had access to a private collection of papers and letters that have never been used in any full Douglass biography, and his new work offers profound insight into Douglass’s life and legacy. Blight spent ten years writing the book, but has been researching Douglass for over 35 years, beginning with his PhD dissertation completed in 1985. Since then, Blight—who is Professor of American History and Director of the Gilder Lehrman Center for the Study of Slavery, Resistance, and Abolition at Yale University—has become the nation’s leading authority on Frederick Douglass. To read this biography is to experience the depth of a great man’s life through the eyes of the author who has worked the longest to understand him best. With Frederick Douglass: Prophet of Freedom, Blight breaks new ground in Douglass scholarship, in particular shedding light on the last thirty years of Douglass’s life and his family relationships, his controversial second marriage, his back-breaking and nearly endless lecture tours into old age, and his role as the leader of black America in Washington D.C.